I love, love, love this cleanser from Avene. I’m a huge fan of Avene anyway, but it just seems that with every new thing that I try, I love them more and more! I think that it’s because my skin gets so fed-up after I’ve been on a shoot – it’s not that it gets particularly sensitive, just a bit temperamental. Especially around the eye area. Avene’s Gentle Cleanser has been formulated for sensitive skin, and so you just know from the off that it’s going to be soothing and calming. I love the fresh, cooling sensation that it brings upon application, and the amazing smell. It’s enriched with moisturisers, so it doesn’t dry skin out or leave it uncomfortable – neither does it leave a greasy residue! And I’ve just realised that I’ve been using it incorrectly – it’s a rinse-off formula, and I’ve been wiping it off with cotton wool – so, you can see from this that it most definitely is a very clean-finish formula. It is recommended that you spritz your face with Avene thermal spring water afterwards, and I think that this is a mighty fine idea – the tiny travel-sized cans of Eau Thermale are one of my most-used Avene products. There we go then; another ‘sigh of relief’ in a bottle. A soothing, calming, freshening formula that will placate the most irate of skins! 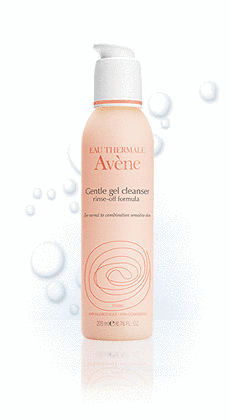 Avene Gentle Gel Cleanser, £11.50 for 200ml from Boots.